Nothing feels better than freshly cleaned and polished teeth. More and more, people are having their teeth whitened, as well. While we may not come out of the dentist looking like a movie start, there is no reason why we can’t feel like one. The benefits of teeth whitening go beyond the cosmetic side of it, although that is a huge bonus. Having your teeth whitened has other benefits and is really all part of your regular dental health care, anyhow. It’s painless and not really expensive to have done, and it is increasingly the most popular beauty treatment that people are giving to themselves. We know we look better but le’ts look a the other benefits of teeth whitening. There is no denying that when our teeth and bright and white, we show them off more, smile more, and laugh more. It boosts our confidence and makes us feel good. We feel good about ourselves and our appearance and that has a very positive effect on our mental health. Covering your mouth because you are self-conscience about your teeth is just a shame and there is no reason to hide where there is a simple way to get help. Smiling and self-confidence are contagious, and it leads to all kinds of positive outcomes in our lives. Self-confidence in ourselves can help us get better jobs, find love and achieve things that we may not have considered that were within our reach before. The benefits of teeth whitening are good for us, but we can pass that one to those around us. There is certainly no shortage of at-home whitening methods available on the market, but the benefits of teeth whitening from your professional outweigh the kits you can use at home. 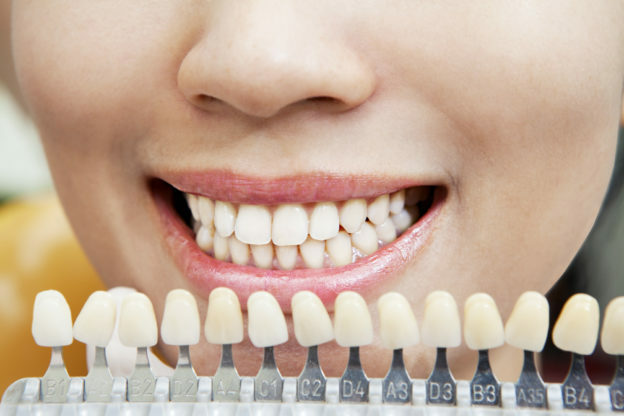 You professional dental provider has access to a much more powerful formula for whitening your teeth. Having the treatment done at the dentist is much more convenient, as there is nothing for you to except lie back and relax while they apply the whitening formula. The cost is actually better, in the long run, for the dentist visit. Their whitening substance used is better and last longer, much longer than the home kits or strips. You will find you need to keep applying the kits you do at home, and may even end up paying more by the year’s end. Did you now that the benefits of teeth whitening can actually extend you your overall physical health? It can. When you go in for a whitening, you have to have an exam and the dentist or hygienist will also clean your teeth. This cleaning gets rid of any bacteria, plaque or other debris that can cause gum disease and some studies have shown it can even have adverse effects on your heart and intestinal tract. There is a possibility you will avoid some of the foods and alcohol that lead to the strains and discoloration and you may see changing in your weight, as well. If you are worried about what the wine, potato chips and all those cups of tea are doing to your new white teeth, you may find yourself changing your eating habits. One of the other hidden benefits of teeth whitening is that once you have had it done, you are far more likely to keep it that way. When you see how fabulous you look, you will work harder to keep your teeth looking that way. Keeping your teeth cleaned, flossed, it may even encourage you to stop smoking, drink less coffee or red wine, or just add awareness to the foods and drinks you like that stained your teeth, to begin with. When you go in for the treatment, you will have to have a dental exam. Your dentist will discover any problems you may have, cavities, cracks or loose caps or fillings. There could also be the beginnings of something else, more serious. You will be more likely to schedule appointments with your dentist to keep your teeth maintained and clean. This leads to better dental health and more awareness for you for any potential problems and just overall better oral health care. To keep the benefits of teeth whitening, you need to put in a little effort. There are a few things you can do to keep your teeth remaining white and bright. This is directly after, but for the duration, as well. There are many drinks that you may enjoy that cannot only stain your teeth but do damage to them, as well. There are also certain lipsticks that can stain your teeth, so try a quality brand if you wear it a lot. Find all-day lipsticks that won’t smudge or bleed. The whitening chewing gum can act as an emergency if you consume something, like coffee and do not have an opportunity to brush your teeth. It can also help get debris out of your teeth and freshen your breath. The benefits of teeth whitening are wide and continue on for you. If you think about the treatment as an investment, you may be more likely to keep your teeth in better condition. You will love how they look and want to keep them that way. If you are considering going in, take a friend or loved one with you, it makes a very good, thoughtful and unique gift for someone. It can make you look younger, feel better and give you the confidence you need to try new things and meet new people. If you are considering treatment, there are certainly more benefits to teeth whitening that just how they look. Contact us for a consultation and find your hidden smile, so you can start to share it and spread it around. This entry was posted in Cosmetic Dentistry on April 18, 2018 by Dr. Laurie Schumacher.